Lee Precision Pacesetter Dies and RGB series dies: Use these dies if you want to produce factory-dimensioned ammo that reliably fits and feeds in any gun. They are the first choice for semi-auto actions. Full-length sizing is a must if you are reloading for more than one firearm or reloading cases that were fired in other guns. Pacesetter dies include the Lee Precision Factory Crimp Die. 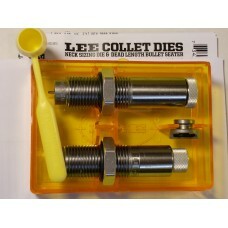 The Lee Precision Collet Neck Sizing Dies: Use these dies for best accuracy, longest case life and no resizing lubricant. Only the neck of the case is resized, the body is untouched so it retains the perfect fit to your gun's chamber. Cases should have been fired in your firearm only. 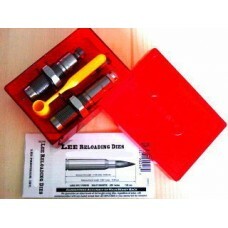 Rounds reloading with Collet Neck Sizing Dies are intended for use in just one firearm. These dies are the favorite of the bench rest crowd as there is no other die that can produce a more accurate cartridge. If you intend to reload cases fired in other guns or you are reloading for more than one gun of the same caliber, select the Lee Precision Ultimate Rifle Die Set. The Ultimate rifle die set includes a full length resizing die, and the factory crimp die. This allows you to restore any case to factory original dimensions so you can fire form the case in your gun and then reload it using the superior Collet neck sizing die. The Lee Precision Rifle Factory crimp die is the only effective way to crimp bottle neck rifle cartridges. This important step should be performed on all loads used for hunting. Applying a Factory crimp will always improve the utility of the cartridge and in most cases it will also improve the accuracy. Do you have a Breech Lock Press? You may also want to order additional bushings and lock rings for your new dies. Lee Precision Breech Lock Bushings and Lee Precision Lock Rings fit all Lee Precision Breech Lock presses. They allow quick, accurate die changes. Or you may prefer the Lee Precision Lock Ring Eliminators which are just Lee Precision Breech Lock Quick Change Bushings with integral lock collars. They provide unmatched precision and convenience when adjusting dies. A split clamp positively locks die into position. Perfect when using other brands of dies in your Breech Lock press. There is no loading system that will load more accurate ammunition than the Lee Precision .300 H&H .. There is no loading system that will load more accurate ammunition than the Lee Precision .303 Brit.. The Lee Precision .243 Winchester Super Short Magnum Factory Crimp Die with standard 7/8" by 14 trh.. The Lee Precision .257 Roberts Factory Crimp Die with standard 7/8" by 14 trheads is packaged in a.. 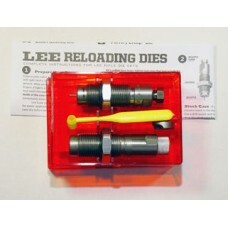 The Lee Precision .348 Winchester Factory Crimp Die with standard 7/8" by 14 trheads is packaged i.. The Lee Precision .416 Remington Magnum Factory Crimp Die with standard 7/8" by 14 trheads is pac.. The Lee Precision .44-40 Winchester Factory Crimp Die with standard 7/8" by 14 trheads is packaged.. The Lee Precision 7.65x53mm Argentine Factory Crimp Die with standard 7/8" by 14 trheads is package.. 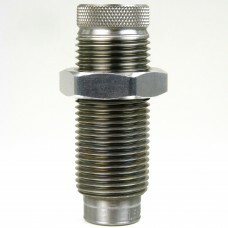 The Lee Precision 7x57mm Factory Crimp Die with standard 7/8" by 14 trheads is packaged in a custom..